PM Modi lashed out at the Karnataka government over alleged corruption, saying that new scams and charges of graft were surfacing “every day” under its watch. Assembly elections are due in the state in late April or early May. In the past, Karnataka Chief Minister Siddramaiah has taken strong exception to PM Modi’s remarks and verbal attacks. The party’s state leaders like B S Yeddyurappa and central ministers Piyush Goel, Prakash Javdekar, Ananth Kumar and D V Sadananada Gowda attended the rally and felicitated Modi with the famous Mysore ‘peta’ (headgear). 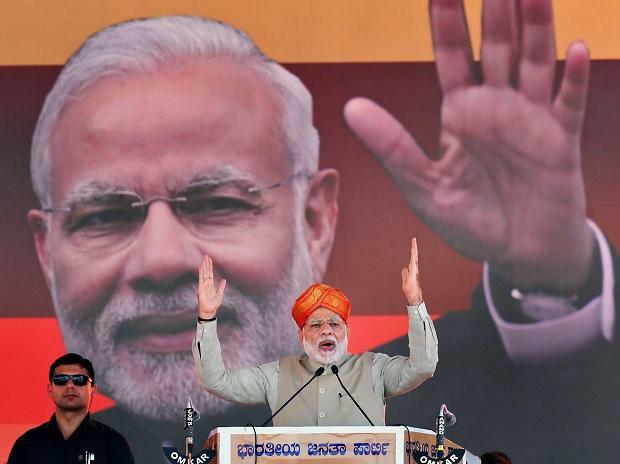 1) Modi claims BJP will form govt with a ‘mission’: Attacking the Congress government in Karnataka as a “commission” government, PM Modi on Monday said the welfare of the people was never its priority and that the state needed a government with a “mission” under the Bharatiya Janata Party (BJP) to ensure all-round development. “Karnataka does not require a ‘commission’ government but a ‘mission’ government led by the BJP which will ensure all-round progress of the state…,” Modi said.